Memoirs of a Madcap Musicmaker Madly Musicmaking and Making Mad Music (Est. 2004): OOOOOOOOOO!!!! Oooo. 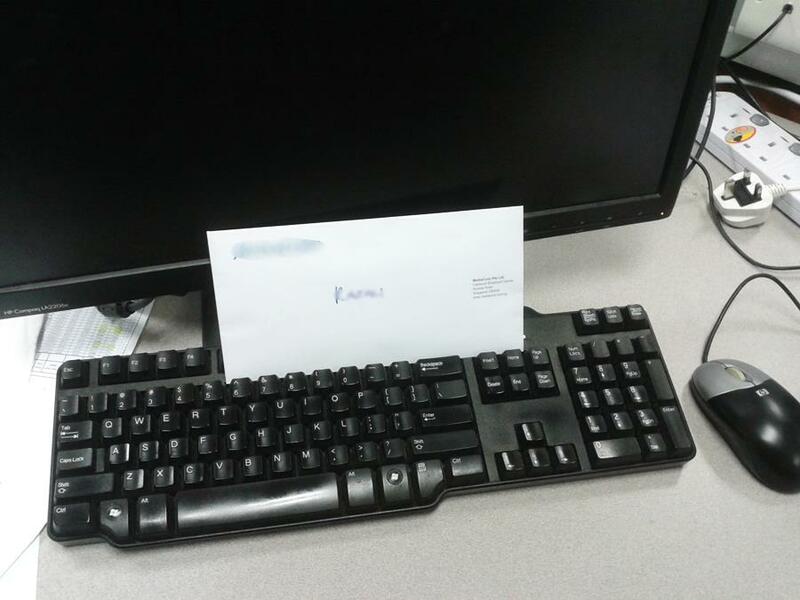 what could be in this envelope that I have left on my boss's desk this afternoon? Could it be.... A LETTER FILLED WITH COMPLIMENTS FOR BEING THE BEST BOSS EVER?!?! Could it be.... A LOVE LETTER DECLARING AN UNDYING DEVOTION FOR THE COMPANY THAT HAS ME AS ITS SLAVE?! Could it be... A CHAIN LETTER SAYING YOU WILL DIE AND YOUR BEST FRIENDS WILL GET RUBELLA IF YOU DON'T FORWARD THIS ON TO 9999 PEOPLE?!?! Could it be..... A LETTER OF RESIGNATION SAYING I'M OUTTA HERE IN ONE MONTH'S TIME?!?!? !